The rhythm is gonna get you. MJ has ventured into the video game realm before (remember Moonwalker? ), but this amazing dancing game celebrates his amazingly inventive moves while getting some entertaining exercise. Players must concentrate on their hands and relating arm movements, not the feet… though most players can probably not help themselves. Up to four players can enjoy this remote only controlled game (no use of the balance board here). The remote only movements make this stellar title a great game for physically handicapped players who still can use their arms. The multiple modes include co-op, competitive 1-on-1, and 2-on-2 sets. The practice mode can help players can their rhythm. Unlockable dance school training videos also aid in gameplay and are fairly easy to unlock though difficult to navigate through and choose specific videos. The school has three choreographers include Travis Payne. Once they are ready, single players can try out the game and have their performance measured in stars as they play. Optional lyrics can stream across the bottom of the screen while the helpful dance figure outlines scroll vertically across the left and/or right sides. Bright colors differentiate the players and the visuals are sharp and appealing. Extensive sound cues might have been helpful in rare situations, but would detract from the music experience and possibly distract players during key moments. Dance with Michael in classic mode or choose between him and his backup dancer in duo mode. The crew mode includes Michael with multiple backup dancers. Players can also achieve bonus points for special gold moves at iconic, special moments. The deep catalog even leaves room for a possible sequel. The outstanding music video recreations take this great experience even higher. “Smooth Criminal”, Wanna Be Startin’ Somethin’”, “The Way You Make Me Feel”, “Heal the World”, “Leave Me Alone”, and “Streetwalker” are included in the Wii version and also reportedly all other versions. 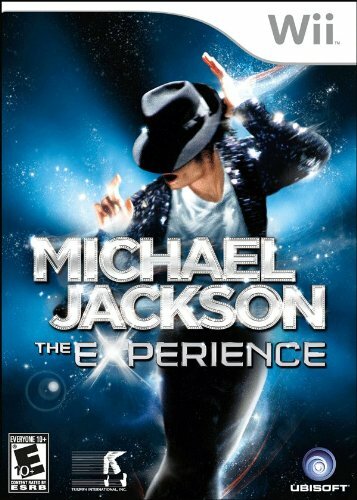 This Wii version also includes standouts like “Bad”, “Beat It”, “Billie Jean”, Black or White, “In the Closet”, “Remember the Time”, “Rock With You”, “The Girl is Mine”, “Who Is It”, and “Will You Be There”. “Thriller” and “Earth Song” also appear though they are edited. Each song has a difficulty level. This King of Pop showcase immortalizes amazing talents including Jackson’s musical producer Quincy Jones. This Wii edition also included a limited edition sequined hand glove replica, which included a humorous, but necessary warning label urging players not to wear it as they play the game. The Wii version does not include the songs “You Rock My World”, “Blood on the Dance Floor”, and “I Just Can’t Stop Loving You”, included on the PlayStation 3 and Xbox 360 versions. Look for future versions on the PlayStation 3 using the PlayStation Move controller on March 1 that includes the optional on-screen lyrics like the Wii version. The Xbox 360 version has the Kinect controller for one-player gameplay but will feature singing. It would be great to see the singing feature in a more comprehensive future installment on the Wii and PlayStation 3 versions. Also available now on the Nintendo DS and PSP, which include shorter songs lists. This entry was posted in Video Game Reviews and tagged Michael Jackson, Michael Jackson The Experience, Michael Siebenaler, Mike Siebenaler, Tall Writer, video games. Bookmark the permalink.